(Vatican Radio/PCCS) Pope Francis has expressed his appreciation for the work being done by all the Vatican’s media services in enhancing their presence and participation in the digital world. The Pope’s words came on Monday as he was given a personal viewing of the new updated version of “The Pope App”, developed by the Pontifical Council for Social Communications. 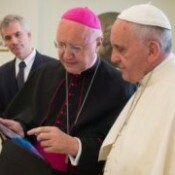 Council President Archbishop Claudio Celli, accompanied by project coordinator, Thaddeus Jones, met with the Pope to demonstrate features of the app, which was released in the iTunes and Google Play stores on July 4th. Available in five languages, the Pope App 2.0 is free and can be downloaded on Apple and Android devices. Powered by News.va, it features the latest papal news and information as produced by the Vatican’s own media services – including Vatican Radio. Its new design simplifies access to content and, according to Archbishop Celli, allows people to be in ever closer contact with the Pope, his ministry and his message of God’s love….